October in Thailand is what the travel industry describes as ‘shoulder-season’. Fewer tourists are around and good deals are usually available on flights and accommodation before the higher rates start to kick in during November. It’s also a month which sees the unofficial end of the rainy season marked by the Buddhist holiday of Awk Phansa. Various local festivals are held to commemorate Awk Phansa and wherever you are in Thailand there is a good chance there will be some event going on nearby. October is an excellent month to explore the Thai countryside with the rice-fields in the north and north-east resplendent in green. The weather is a mix of sunshine and showers so carry a small umbrella with you. Cheap foldable umbrellas can be bought at markets in Thailand (or the ever-reliable 7-Eleven) for as little as 100 Baht. Look for ones with a UV protective coating which are more durable and also double-up as protection against the rain or the sun making them perfect for the variable October weather. Photos taken in October in Thailand. 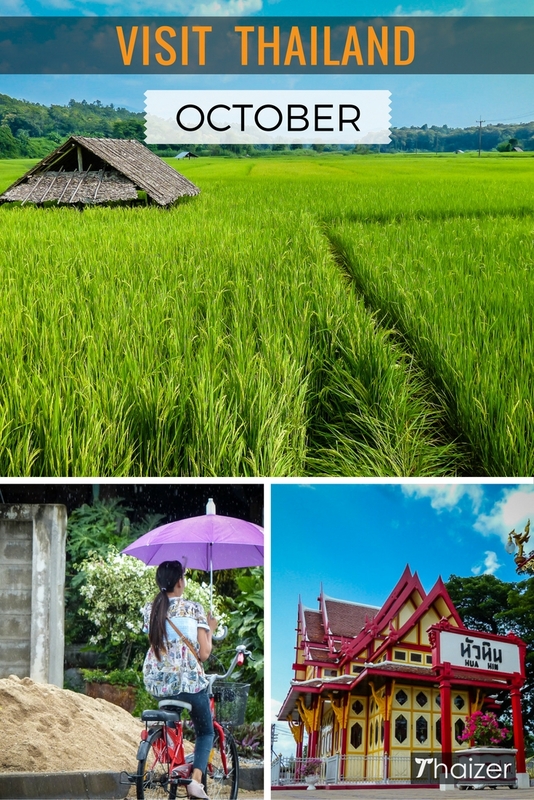 Clockwise from top: rice-fields in Mae Hong Son, a sunny afternoon at Hua Hin railway station, a rainy morning in Chiang Saen (Chiang Rai province). October can widely be regarded as the last of the rainy season months for many areas of Thailand, but there are some regional variations. The weather in Thailand in October can be a mixed bag and isn’t easy to predict. Some years the rainy season extends longer then usual and some years it finishes early. The weather tends to be more settled on the mainland, particularly in the second half of October. Although there can be sporadic heavy rainfall during October, temperatures are warm and you should see plenty of blue sky and sunshine wherever you stay during your visit. Generally speaking, when the clouds roll in and the rain does come it tends to be in the form of short, sharp downpours rather than prolonged periods. October is a good month to explore Bangkok and nearby areas such as Ayutthaya and Kanchanaburi. It’s also a great time of the year to get out into the Thai countryside in the north and north-east and enjoy the greenery, waterfalls and natural attractions. The effects of the monsoon brings different weather patterns to the southern Thai islands resulting in higher rainfall figures compared to the mainland. That doesn’t necessarily mean you should avoid the islands in the south, but be prepared for some potentially heavy downpours mixed in with the sunshine. During my travels in the south of Thailand during October I’ve experienced good, bad and indifferent weather on islands on the Andaman and Gulf Coast so you have to be prepared to take the rough with the smooth. The weather table below details the yearly averages for some of the most popular destinations in Thailand during October. Which is the best Thai island or beach resort to visit in October? There are no guarantees with the weather in Thailand during October and it’s impossible to predict what will happen on any given day. You could see hours of sunshine, you could see a torrential downpour or you could see a mix of the two. If you are spending a week or more on any Thai island during October you can definitely expect to see some rain. The downpours on the southern islands can be torrential in October, but that doesn’t mean it rains all day every day. Far from it. Visitors are also likely to experience plenty of sunshine and warm temperatures on the southern Thai islands in October. You’d be unlucky to see relentless rain for most of the day, but localised weather systems can develop and it can happen. Be prepared for rainy days and take that into consideration when booking accommodation and making travel plans. Boat services to outlying islands (e.g. the Trang islands) can sometimes be disrupted and some bungalow operations on the quieter islands remain closed during October. More developed islands such as Ko Samui and Phuket provide ample things to do for people of all ages if the weather does a take a turn for the worse. This makes them both good options for an island getaway in October. If you’re looking for a beach break with a better prospect for settled weather, consider staying on the mainland which tends to see less rainfall compared to the islands. Hua Hin and Cha Am south of Bangkok are solid options as is Pattaya on the east coast. It’s worth spending extra to get more comfort. Basic beach bungalows can be wonderful when the weather is perfect, but on a rainy afternoon you may be thankful for spending extra Baht on your accommodation if it includes free wi-fi, a TV and a gym. The first half of the month, especially on the more exposed islands in the Andaman Sea (e.g. the Trang islands) can still see torrential downpours accompanied by gusty winds and rough seas which disrupt boat services. That doesn’t mean that you shouldn’t visit the Andaman Coast during October, but be prepared for potentially heavy downpours. Phuket and Krabi are less exposed and will still see ample sunshine and can be good choices in October, particularly the second half of the month. For islands in the Gulf of Thailand, the amount of October rainfall in any given year depends on how early the north-east monsoon winds blow in. October on Ko Samui is usually wetter than September, but not as wet as November. On average, you should see less rain on the Gulf Coast islands during the first half of October compared to the second half. However, temperatures remain high throughout the month and you can also expect to see blue skies and plenty of sunshine during an October visit to Ko Samui, Ko Tao or Ko Pha Ngan. Pattaya generally sees decent weather during October with good amounts of sunshine. Heavy downpours can occur at any time, but are more likely to be late afternoon or early evening for a few hours before clearing away. In recent years the drainage system in Pattaya has sometimes struggled to cope with the rainy season deluges and localised flash flooding can occur. But it’s all part of the rainy season experience in Thailand and can be fascinating to watch how locals take it in their stride. Ko Samet enjoys a sheltered location which means it is protected from the worst of the rainy season weather. The island does see rain in October, but levels are low and it is statistically one of the driest beach locations in Thailand to visit at this time of the year. Further east, Ko Chang and nearby islands see high levels of rainfall during October. However, the heaviest downpours usually occur at night. During the day you should see sunshine interspersed with isolated showers. Always take note of warning flags on beaches. Sadly, too many people have ignored these on Thai beaches in the past and been caught up in rip tides. Another potential danger to look out for is the presence of jellyfish which do sometimes come close to shore during September and October. The risk can vary from year to year depending on weather conditions, but there have been fatalities in Thailand from box jellyfish stings. Warning notices and first-aid stations are placed on affected beaches. Awk Phansa is a Buddhist holiday to mark the end of the rains retreat and is accompanied by a host of merit-making events. One of the most common ones that visitors to Thailand in October may see is the khatina robes ceremony. Elsewhere around the kingdom, there are local festivals which reflect the culture of that particular province such as the Chong Para Festival in Mae Hong Son and the Buffalo Racing Festival in Chonburi. October 23 is a national holiday in Thailand in honour of one of the most revered figures in Thai history, King Chulalongkorn (Rama V). Long-boat races are held in many provinces of Thailand from September through to November. In October, boat races are held in Buriram, Chachoengsao, Nan, Nakhon Sawan and Nakhon Ratchasima. The Vegetarian Festival often falls in October as part of the Taoist Lent period. Celebrated by Thais of Chinese heritage, the most famous examples of the Vegetarian Festival in Thailand can be found in Phuket and Bangkok’s Chinatown. There are also local events held in a number of other locations including Chiang Mai, Krabi, Pattaya and Trang.